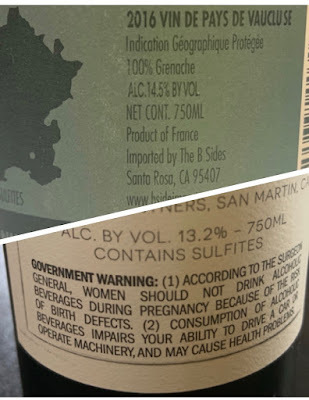 One of the perks of being a member of the #WinePW is giving myself opportunities to try wines that I may not normally think of drinking or buying. I'm so excited to receive Jill Barth's "Straight From Uruguay Wine, Food and #WinePW Stories" invite, an opportunity to explore the lesser-known wines. After reading the invite, the "live for the moment" part of me wants to hop on a plane (or maybe two planes), and go to Uruguay’s capital city, Montevideo right away and experience the vibrant wine and food culture there. Well, the rational part of me wins, and holds me back down to my chair, fingers at my keyboard, to start searching for Uruguay's crown jewel - its signature red wine, Tannat! I probably had tasted Tannat in a blend a few times, and honestly couldn't tell how this grape would taste alone. 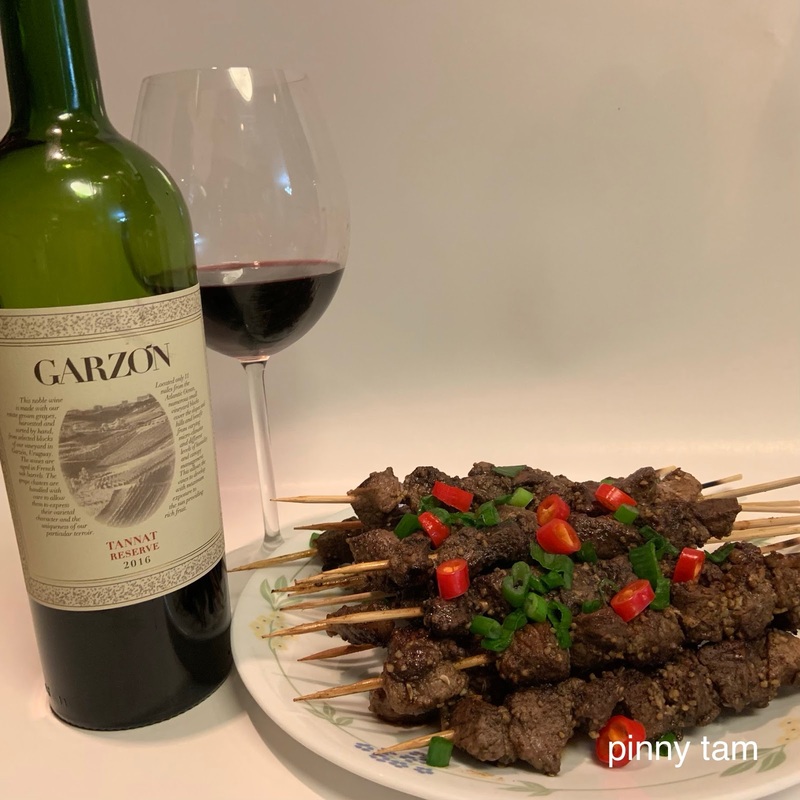 After trying Bodega Garzon‘s 2016 Tannat Reserve, this 100% Tannat which has been rated 90 points by Wine Enthusiast, may very well become one of my favorites to pair with Chinese BBQ or pan-fried lamb and beef dishes or without any pairings. 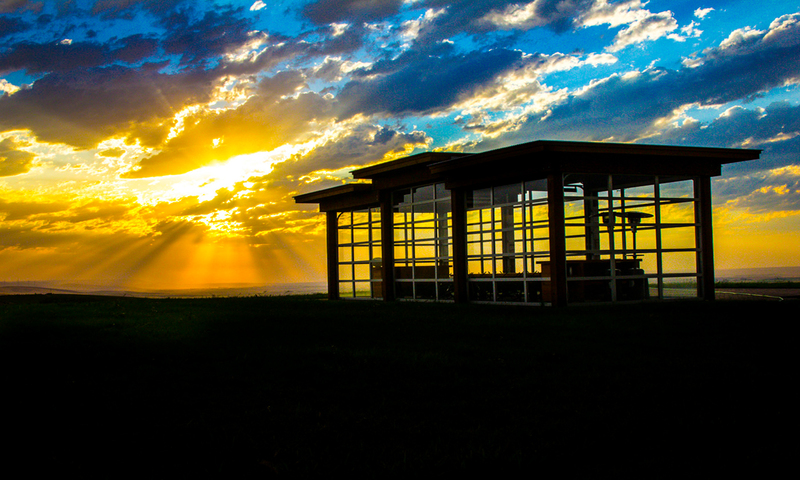 Bodega Garzon is located in the Maldonado region of Uruguay, which is mesmerized with ballast hills, soft and stony soils and Atlantic breezes, and paints the perfect terrior for creating elegant and complex wines. "This noble wine is made with our estate grown grapes, harvested and sorted by hand, from selected blocks of our vineyard in Garzon, Uruguay. The wines are aged in French oak barrels. The grape clusters are handled with care to allow them to express their varietal character and the uniqueness of our particular terroir. Located only 11 miles from the Atlantic Ocean, numerous small vineyard blocks cover the slopes and hills and benefit from varying micro-climates and different levels of humanity and canopy management. This allows the vines to develop with maximum exposure to the sun providing rich fruit." The wine is oaky with a tad cocoa on the nose. It tastes lush blackberry and cassis, tangy acidity, wood spices, opening up to full-body, texture and firm tannis, showing the landmark characteristics of the coastal Tannat wines in Uruguay and finishing with peppery and savory notes. Sticking with the traditional pairing, like what Uruguayans do, I’m going to start off by pairing this wine with a Chinese beef dish. The thinly sliced beef short rib is marinated in soya sauce, a little brown sugar, minced garlic and rice wine for at least an hour, and is pan-fried until it’s brown both sides. What’s so special about this beef rib is that its slice-cut allows the cooking time to be significantly reduced when compared to chunky beef short ribs. The beef rib slices still retain the chewy textural mouthfeel with meat still on the bone, and are quick to cook as a daily dish without the long-hour laboring and braising. No doubt in my mind, the Tannat Reserve is a perfect BBQ wine as it is fruit-forward, tangy and smoky, enhancing both saucy and dry-rubbed BBQ meat. 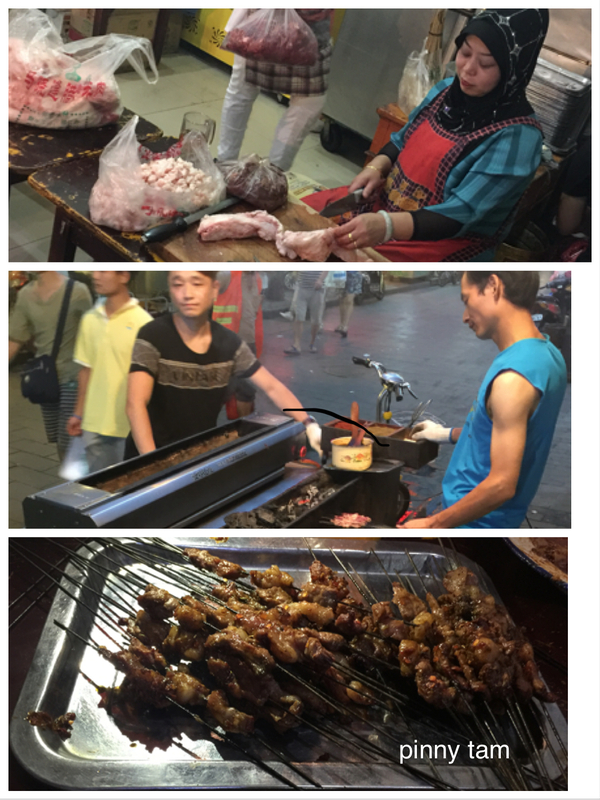 Xinjiang Lamb Skewers or Yang Rou Chuan (新疆烤串)is a famous lamb dish in Northwest China where the Muslim populations congregate. · 1 1/2 pounds leg of lamb, cut the lamb in ¾ inch cubes. Ask the butcher to debone the leg of lamb if possible. The leg of lamb sold at Costco typically comes as boneless. Leg of lamb can be substituted by lamb chops. 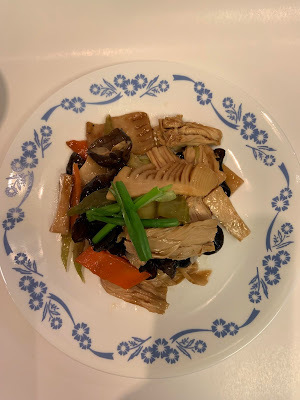 · 2 tablespoons of Shaoxing Wine. Substitute with rice wine if Shaoxing wine is not available. · Marinate the lamb cubes with all the ingredients above at least for four hours or overnight. No dipping or BBQ sauce is served with the skewers so marinating the lamb is important to yield flavorful meat. 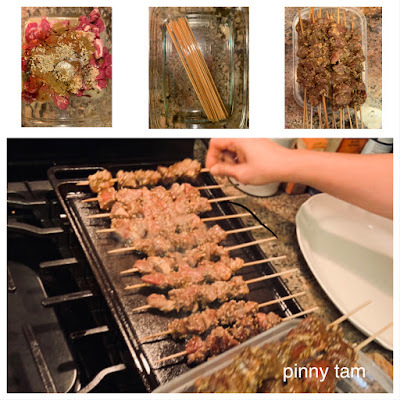 · Soak the bamboo skewers in water overnight so they won’t burn so fast while BBQ’ing. · Skew seven cubes on each skewer. · Ideally, a rectangular cast iron pan is used, but any grill that generates high heat fast can be used. · Heat the cast iron pan on high on the stove. · Drizzle canola oil on the pan until it’s smoking. · Line up the skewers on the pan without crowding. · Cook both sides until the meat looks a bit charcoal. To serve with the beef and lamb, I’m cooking an earthy vegetable medley that has carrot, bamboo shoots, shitake mushrooms, rehydrated woodear mushrooms (a Chinese fugus used also in hot and sour soup) and tofu sticks. Simply slice all the ingredients, stir-fry it in a non-stick frying pan, add 2 tablespoons of oyster sauce to taste, and cook it with ¼ cup of vegetable stock for 5 minutes. Finish with corn starch solution and a drizzle of sesame oil. 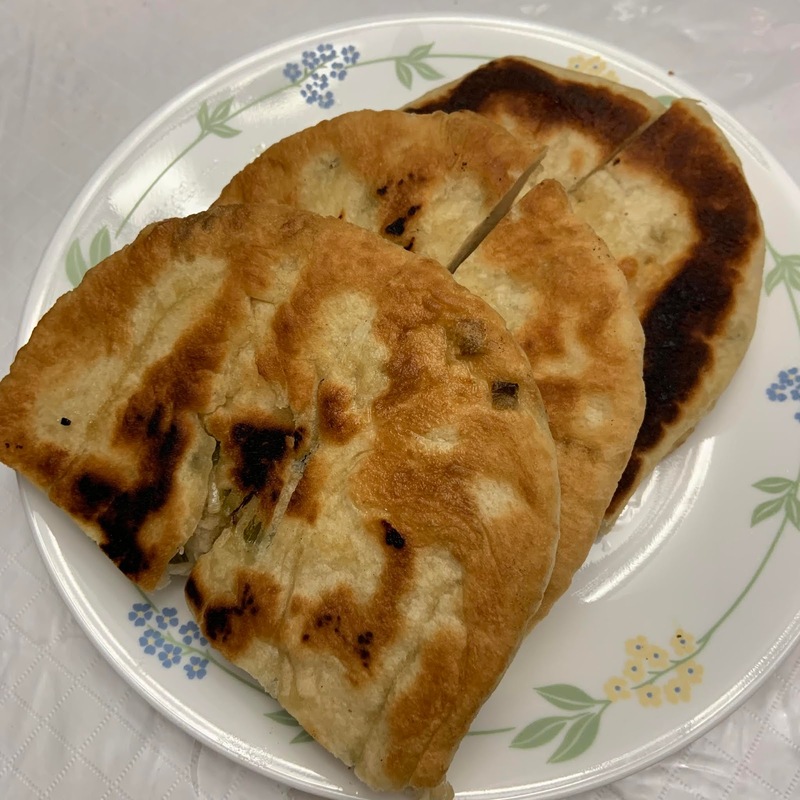 Any flat bread will go well with these dishes but I choose the thick scallion bread I got from the Asian grocery store. I’m sure this Tannat Reserve can pair many cuisines. 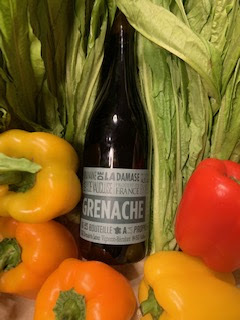 However, I’m flabbergasted how well this pairing turns out to what it should be...wine and food together produce synergy and surpass expectations! If you are looking for high-quality red wines, the Pacific Northwest is a destination you shouldn’t skip. I was fortunate to taste a lot of excellent red wines in the #WBC18 trip in October 2018, and was extremely impressed with the five red wines that I love from the Walla Walla, Hood River and Columbia River Gorge areas. 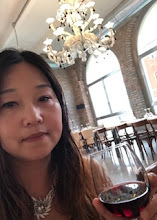 Let me walk you through why these five wines are worth every penny, and mostly impressively will pair well with the Chinese food I recommended. 2015 Cathedral Ridge Winery Hillside Zinfandel Reserve ($27) is an award-winning wine that is at the entry-level price for the region. What makes this 100% Red Zin really stands out is its concentration of blackberry flavors, thicker tannin and a streak of expresso, in addition to the typical fruity-forwardness that presents in most Zins. The subtle characteristics complement well with Chinese BBQ meat which is marinated in hoisin, oyster, soya sauce and honey. Once these marinated pork, chicken wings or chicken giblets if you fancy them are being BBQ in the charcoal or regular oven, they are a tad sweet, moist, smoky, charcoal-fragrant and are bursting in flavors. 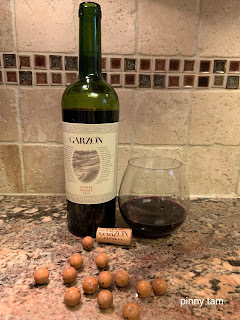 These flavors interact really well with this complex Red Zin that is fresh to the palate but is interesting with the dark fruit and coffee notes. Crispy pork belly, which has the cracker-like crispy skin when done, is another dish that will make this Zin dance. The salty pork belly, with 60% lean meat and 40% fat, needs the Zin’s fruitiness to lighten its somewhat fatty texture. 2013 g. Cuneo Nebbaro Red ($35) is a blend of Nebbiolo and Barbera, which style is not typically made in Piemonte, the Northern root of these Italian grapes. The combination of these two grapes is sought-after in the US as it embraces the best of both worlds a wine can offer…significant structure empowered by Nebbiolo, with the finesse, color and fruit notes coming from Barbera. This blend provides a food friendly unity that allows a wide range of food pairing options including some famous Chinese beef dishes. The five-spice beef shank is braised in mijiu (rice cooking wine), soya sauce, anise and of course five-spice to fork-tender. After it is cool off, it is sliced and is served at room temperature as appetizers. Nebbaro’s fresh fruit notes won’t overpower the warm spices, but rather makes the lean shank slices taste juicier. One of the world’s most famous noodle soups is Taiwanese Braised Beef Noodle. The beef chunks are cooked in dark soya sauce, dry spices and fresh herbs for a long time until the chopsticks can pull the meat apart. The beef is deeply flavored which may “bully” any weak reds such as Pinot Noir or Beaujolais. The Nebbiolo in this wine can definitely deal with this aromatic hearty beef. 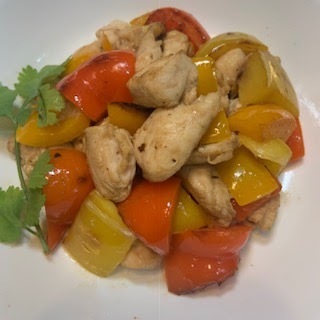 Poultry is another most used protein for Chinese cuisines after pork. Ducks are undoubtedly pricier meat that is served in special occasions. 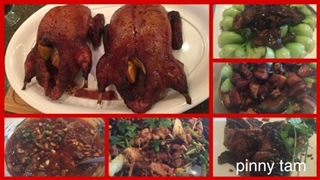 Flattened Roast Duck or Pei Pa Duck, a cousin of the Peking duck – similar preparation, is a seasoned duck that is butterflied to the shape of an ancient Chinese music instrument called Pei Pa (the shape of a tennis racket) prior to roasting. The skin of the duck becomes very crispy due to its larger exposure to the oven heat. The 2011 Maryhill Sugarloaf Vineyards Mourvedre ($40) looks crystal garnet in the glass, smells musky on the nose, but tastes young yet earthy on the palate. The youthfulness comes from the berries like raspberry, strawberry, cranberry, black berry and plum. 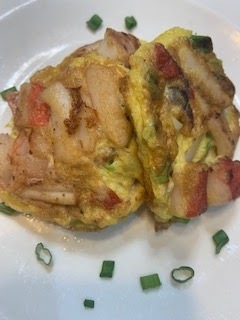 The earthy notes draw from the limestone, smokiness, warm Asian spices, tea, coco powder and coffee notes that show up every now and then depending on what food you pairs it with. The medium tannin and vibrant acidity of this wine accentuates the meaty/fatty duck. 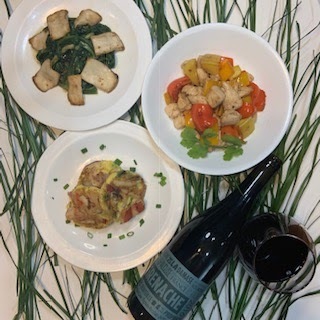 This red blend will also pair really well with the Soya Sauce Chicken which has the most juicy and glossy golden brown skin and tender meat that impresses anyone’s taste bud! As a red wine drinker, I’m deeply in love with the 2012 L'ecole #41 Seven Hills Vineyard Perigee Bordeaux Red Blend ($50). This Blend has over half Cabernet Sauvignon with the balance of Merlot, Cabernet Franc, Malbec and Petit Verdot. It is a memorable red blend that is full of aromas of herbs, barrel spices, and dark cherry. This Bordeaux style is to impress the drinker who craves for instant gratification, but can decant the wine at least an hour prior to a pour they have been anxiously waiting for. Or to reveal its full aging potential, it can be cellared for 10 to 20 years. It’s richness and polish structure does reflect on the price tag. 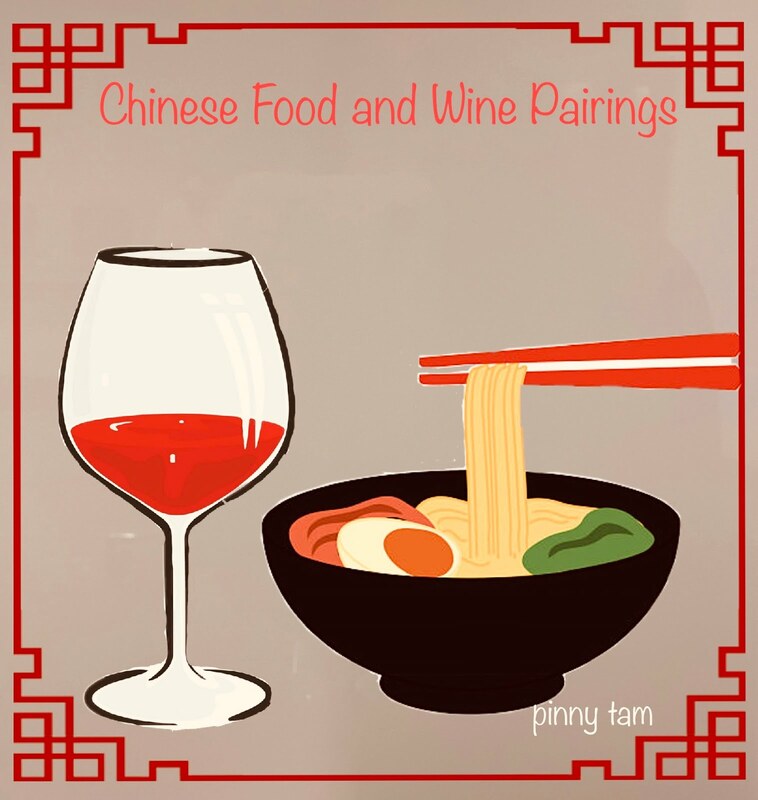 The heavy and long grip of this wine provides many pairing options for heavier Chinese comfort food that is served in the winter. Chinese Braised Lamb Stew in Fermented Beancurd (small chucks of tofu) is a lamb stew that is cooked in aged and deeply salted beancurd. 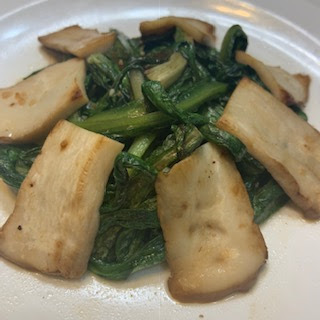 The aged beancurd produces a spicy piquancy, buttery and tangy flavors, which mimics blue cheese in texture, taste and smell. After the lamb chunks and rehydrated tofu sticks smothers in the beancurd for a few hours, it comes out to be creamy, rich and not gamy. Serve immediately with some chopped fresh dill. This Bordeaux red blend does the magic to the moist skin-on lamb chunks. 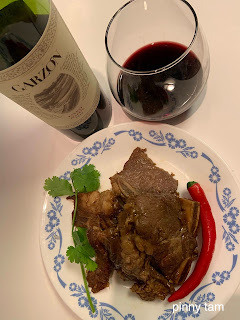 Asian-style Braised Beef Short Ribs can also be coupled with this red with ease and harmony. 2012 Woodward Canyon Estate Reserve Red ($75) has equal part of Merlot, Cabernet Sauvignon and Cabernet Franc, adding an ample dosage of Petit Verdot (18%). 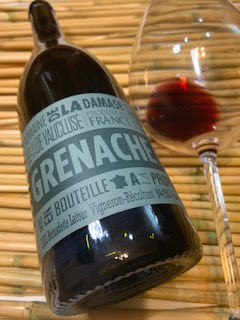 The mix of fruit, savory elements, with notes potting soil, green coffee beans, fresh herbs, generous barrel spices and licorice is why this wine can fetch this price. The long finish of this wine clings to your palate, making the wine and the food memorable. The Braised Dark Soya Sauce Pork Belly with Chinese Preserved Mustard Green is a heavy dish that showcases the pork belly with intense earthy root flavor that comes from the salty preserved vegetable.